Wednesday May 19th 1897 I put the netting on the windows in the boys room up stairs and did some other work. In the afternoon I made another coop. Will put in the screens in the front room in the afternoon. Did evening work and went to bed early. Thursday May 20th 1897 I did baking in the forenoon. I took Aunty over some chicken soup. I did sweeping up stairs in the afternoon and washed some windows. George Jordan quit work tonight. 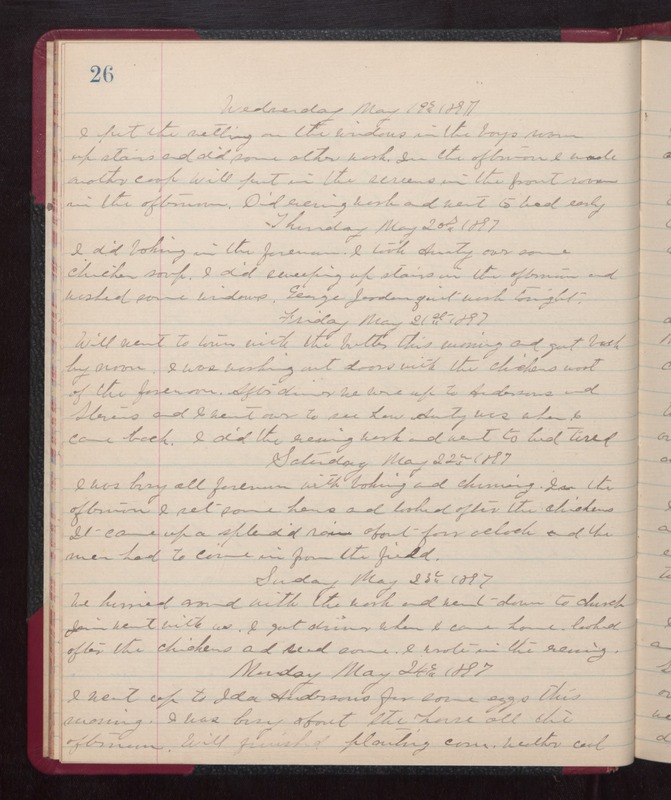 Friday May 21st 1897 Will went to town with the butter this morning and got back by noon. I was working out doors with the chickens most of the forenoon. After dinner we were up to Andersons and Stevens and I went over to see how Aunty was when I came back. I did the evening work and went to bed tired. Saturday May 22nd 1897 I was busy all forenoon with baking and churning. In the afternoon I set some hens and looked after the chickens. It came up a splendid rain about four oclock and the men had to come in from the field. Sunday May 23rd 1897 We hurried around with the work and went down to church Jim went with us. I got dinner when I came home. looked after the chickens and read some. I wrote in the evening. Monday May 24th 1897 I went up to Ida Andersons for some eggs this morning. I was busy about the house all the afternoon. Will finished planting corn. Weather cool.